After setting up a Memeo account, you then use Memeo Share to set up sharing circles, where you control who can see your images and movies by setting up sharing circles. You can define whether visitors can upload their own images as well, making this an ideal way to create a shared image depository for a geographically-spread-out family. Visitors can leave comments on images, and the images are uploaded at full quality (though RAW support is not yet present, I was told it’s being worked on). You can set up multiple sharing circles—one for friends and family with upload rights, and another for coworkers, for instance, with viewing-only rights. 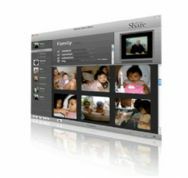 You can add files via drag and drop, or by sharing iPhoto albums directly. Based on my initial impressions from a visit to the Memeo booth at Macworld Expo, Memeo Share looks to be a simple, powerful, and easy-to-use photo sharing application.